If you observe the corner spaces of most offices or homes carefully, then you'll realize that most are underutilized. This is not a surprise as corners are tricky to work with. Thankfully, an L-shaped executive desk is perfectly adapted in corners, providing you with more work space and storage area. If you are shopping for an L-shaped desk, you probably know this for a fact. To help you with your shopping task, this article includes ten of the best L-shaped executive desks available online. You’ll also find a guide below on how to choose the best one for your specific situation. It’s an L-shaped executive desk that leans towards a contemporary style. It comes with a heather gray color with matching chrome hardware. Hence, it can work well in most interior design settings whether it's in the office or the home. The durability of the piece is arguably above average considering it's a mix of solid and engineered wood. It also features plenty of storage and shelf space. It's not too expensive and comes with excellent durability and functionality. This L-shape desk comes with a streamlined structure and clean lines. It's an excellent choice if you are aiming for something that's minimalist in design. The piece is crafted from Canada, and it's primarily made from high-quality particle board. As a result, you can safely expect the item to be budget-friendly and reasonably durable. The desk features two drawers and seven open shelves. One drawer is specially designed for storing A4 folders and legal documents. Toledo is an L-shaped desk with a hutch, offering you more storage space and functionality. The hutch features a single covered shelf and six open shelves. The central covered shelf comes with a transparent window, adding more style while keeping the items inside a bit more secure. The desk comes with four USB ports integrated into the main platform. That's something that is above average as most only offer two ports. 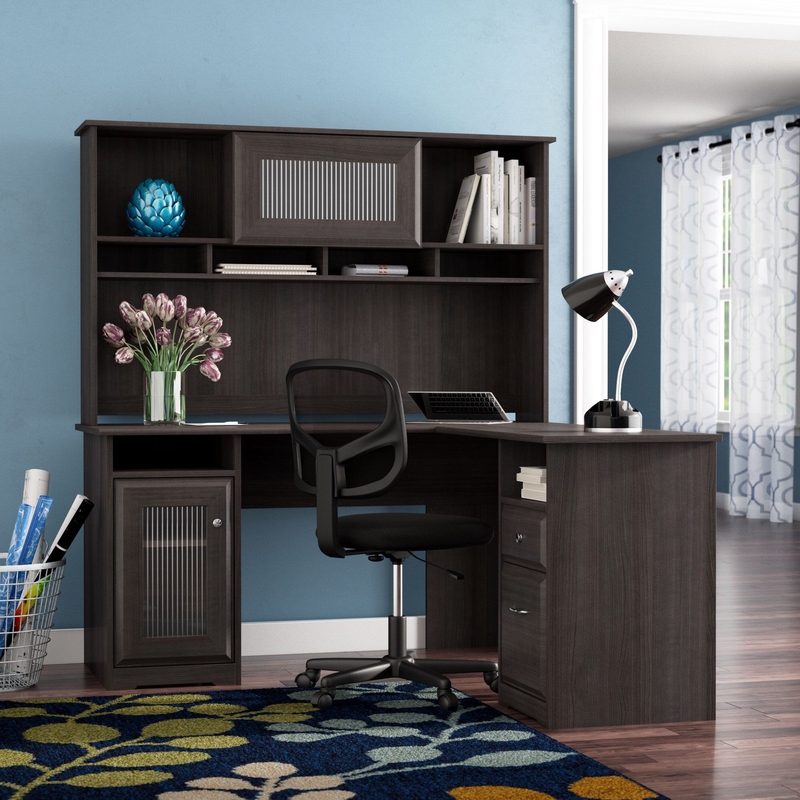 This L-shaped desk features a classic design that comes with extra durability. The desk is crafted from solid wood with cherry veneers. Thus, you can expect this desk to last for a very long time. Despite having a traditional look, it comes with a tray specifically for a keyboard and mouse combo. It offers a spacious legroom, which makes it a great option if you have a CPU unit. It’s a desk that comes with that classy feel of the traditional but can work well in the modern world. Here we have an L-shaped desk that comes with a thin profile and two-tone color scheme. If you are looking for an L-shaped desk that comes with a contemporary, modern or minimalistic look, then you'll hardly make a mistake by getting this one. Furthermore, the neutral color allows it to blend well with most interior design settings. The desk features three drawers. One drawer comes with a lock and key, making it a viable space for storing valuables. It also comes with a keyboard tray and a drawer for A4 folders. This L-shape desk is designed with one purpose in mind, and that's luxuriousness. This piece is loaded with high-end features both on the inside and out. The desk is crafted from solids, specifically maple hardwood. It features felt-lined box drawers on black metal slides and ball bearing sliding mechanism. With a keyboard tray and cable grommet, it's an executive L-shaped desk that's compatible in the modern times. The chocolate patina finish further enhances its professional look. A desk that excels at bringing out the natural beauty of wood. It comes with a medium oak finish that gives the desk a warm and cozy glow. Because the manufacturing process does not interfere with the wood's natural grain pattern, each product is unique in its own way. Aside from the attractive aesthetics, the desk is also made to last. The desk is primarily crafted from solid hardwood and oak veneers. It also comes with a keyboard tray and seven drawers. If there's one word to describe this L-shaped desk, then it has to be the term "grand." The piece is massive, finely crafted and beautiful. The desk is adorned with exquisite details. With hardwoods and mahogany veneers, it's just as durable as it's elegant. Despite having an "old world" charm, this desk is compatible with the information age thanks to the integrated power strip and cable grommet. Also, the desk features ten drawers. Running out of storage space with this desk is an unlikely scenario. This L-shape desk is built to impress and provide you with a very spacious work area. Everything about it communicates a modern look from the "floating desk" design, beveled edge to the slim profile. Don't let the thin construction fool you into thinking that it's not a durable piece. Made mostly from metal, it's resistant to nicks, scratches, rust, and stains. Also, moisture and water damage are not a thing to worry about. Despite having a limited storage space of three drawers, it more than makes up for it with the tremendous amount of space. One of the first things that you will notice when shopping for an L-shaped executive desk is the abundance of types and varieties. Having plenty of options is always a good thing as you can always find the one that is "perfect" for your situation. On the downside, the choices can also be confusing. The shopping task is a lot easier if you know what to look for before you begin. Hence, you should define as clearly as possible the kind of L-shaped desk you want or need. By doing so, you weed out the unnecessary options so you'll have a manageable list of choices. If you're having a bit of difficulty in defining what you want or need, then this article can help you with a buying guide. The L-shaped desk is different as it comes with a general shape similar to the "L" letter. The great thing about this shape is it can help you maximize a corner space. However, the shape has a big drawback. The L-shape is fixed and "locked" to a specific side. It's not like a rectangular desk that you can just turn around and make it work. Hence, before you even start shopping, you'd want to know if you're looking for a right-facing or left-facing L-shaped executive desk. This is a crucial step and making a mistake would generally lead to serious headaches. An L-shaped executive desk may come in either wood or metal. The primary material of an l-shape executive desk is a factor that you need to assess seriously as it will have a significant impact on the desk’s longevity, cost, and of course, its appearance. Wood is the traditional material for desks. Generally, a wooden l-shape executive desk is often seen as more luxurious and classier. You'll also have more choices with wooden desks compared to metal types. The downside with wood is it does not play well with moisture and water. Hence, it requires more maintenance. Also, it's typically costlier compared to a metal desk. Another thing to consider is the type of wood used to manufacture your new desk. The typical wood types typically include particleboard, manufactured wood, and solid wood. Solid wood is the most durable option, but it's also the most expensive. As for particleboard, it is the most economical choice, but it's also the most fragile. Manufactured wood sits in the middle of particleboard and solid wood with regards to durability and cost. A desk that's primarily crafted from metal has the advantage of being more durable than wood. You also don't have to worry too much about nicks, scratches, stains, and maintenance. If you are buying a high-quality stainless steel type, then you definitely won’t have to worry about rust. Metal desks are attractive options as they are more lightweight and portable. On the downside, metal desks typically don't age well. Also, your options are usually limited to contemporary, modern or minimalistic styles.